Law enforcement officers raided the headquarters of the Union of Oil Workers in Northern Rio de Janeiro (Sindipetro-NF) in the city of Macaé last Saturday, Oct. 20, and seized copies of the Brasil de Fato special compact edition on the elections, as well as copies of the Boletim Nascente, the union’s weekly outlet. There are reports claiming the officers, working for the regional electoral court (TRE), tried to jump over the gates of the headquarters and threatened to shoot at the doorman if he didn’t open the door. As it was Saturday, there were no activities at the building. A union director had to go to the facilities and made sure the authorities had free access to it. "Oil workers have always been in favor of an independent, alternative media. It is not a coincidence that we are constantly discussing how we should counter the mainstream media that attacked Petrobras for years without any concern for the company’s image. So, for this union, there is no wrongdoing in the entity’s practices, as it has a commitment, in its bylaws, to the members it represents and the people in the cities where it operates,” the Sindipetro-NF wrote in a statement. He also says the newspaper has been around for more than 15 years and it has consolidated its position as a people’s outlet publishing critical reporting, gaining respect for its work. “The TRE move shows arbitrariness. No one was served, there was only this out-of-the-ordinary search and seizure [operation]. While other newspapers exposed WhatsApp actions of unimaginable proportions and you don’t see anything to counter that, the TRE is persecuting people’s media efforts. We hope this material is returned,” he adds. Brasil de Fato contacted the TRE, but its PR office did not immediately respond to requests for comment. 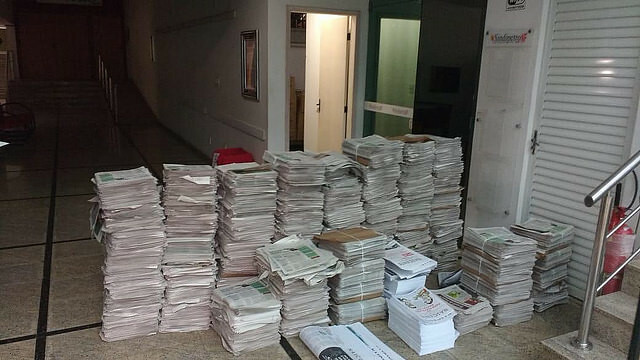 "Brasil de Fato publicly and firmly repudiates the warrant issued to search and seize thousands of copies of the special Elections 2018 edition of the compact newspaper ordered by the Regional Electoral Court (TRE) this Saturday (20) at the headquarters of the Union of Oil Workers of Northern Rio de Janeiro (Sindipetro-NF) in the city of Macaé (RJ). The order, issued by judge Sandro de Araújo Lontra, signals a clear attempt to censor and coerce the alternative media. The newspaper’s content is entirely and strictly journalistic, and all information included in it was appropriately investigated and even reported by mainstream media outlets. This attitude is absurd and strengthens Jair Bolsonaro’s campaign, which is based on spreading fake news and encouraging violence. Part of the mainstream media supports him every day without ever being coerced. The decision is yet another proof of how partisanized sectors of the judicial system are, as they want to make sure the election results support the interests of the elite and international capital. Unlike the traditional mainstream media, we have never hidden our editorial guidelines in our 15 years of operations, and we’ve always been committed to the truth and journalistic rigor. Therefore, the order becomes a clear example of the sensitive political moment the country is facing, with constant attacks on democracy and the intensification of a state of exception since the 2016 coup. It is important to highlight that, in face of thousands of scandals where fake news are being distributed via WhatsApp and tearing the Brazilian electoral process, the court system has not taken the necessary measures to rein in and stop the dissemination of those kinds of materials. This was an order to censor free critical thinking. We reiterate that attitudes like this will not intimidate us. They will actually only strengthen our commitment to the truth and the Brazilian people, and the need to fight to make the necessary changes for our country. We will take all possible legal measures against this abuse. The Brasil de Fato newspaper reinforces its commitment to democracy, freedom of press, and a people’s viewpoint on Brazil and the world. We have overcome a dictatorship that silenced and censored the arts, thinking, journalism, and all of society. Torture is unacceptable and we will keep exposing candidates who support and encourage it. Just like we will keep opposing whoever wants to bring the gag back. Brasil de Fato – A people’s viewpoint on Brazil and the World"